with a Good News Certificate of Excellence. Fill out the Appreciation Form below. Is your pastor on your Christmas shopping list? 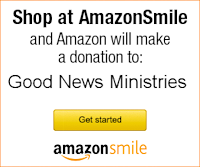 We’re offering a wonderful way to give him a gift! What about the Director of Religious Education or catechist who works so hard to teach the faith to children? Or the RCIA team leader who leads others into a faith that’s fully alive? Honor your favorite priest or faith formation leader with a Good News Certificate of Excellence. 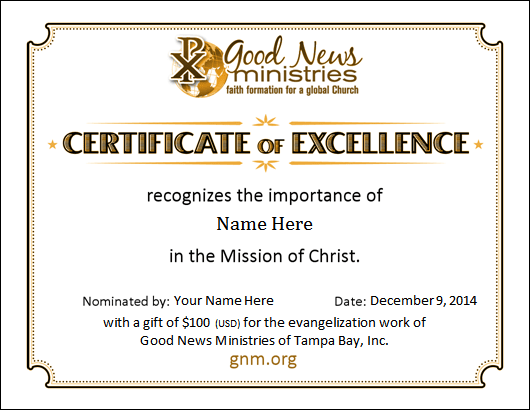 When you give support to Good News Ministries so we can continue our mission of evangelizing and strengthening the faith of Catholics, dedicate the gift to someone who works hard to spread the Good News in your life. Name someone who deserves accolades. 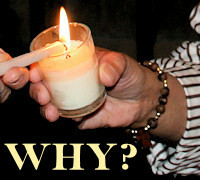 Honor him or her with a gift that supports evangelization. 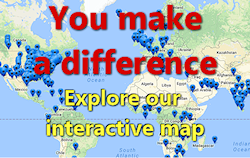 When we receive your donation, we’ll email you a special certificate of your appreciation that you can print and give to him or her (or, if they live far from you, email it). Simply fill out the Appreciation Form below. We believe that working hard to build the faith of others is extremely important and has eternal impacts. Unfortunately, those who do this work are usually never thanked enough. When you give someone a Certificate of Excellence, you will bless him or her with more than you might imagine. Very possibly it will be the only word of encouragement they receive during a very difficult day. Check this if you want to keep it secret.